Christians searching for new ways to deepen their connection to God have embraced Bible journaling. Bible journaling is a way to pause and reflect on Scripture while exploring creativity. The Art of Bible Journaling includes all of the inspiration and information one needs to embark on this exciting journey. Author Erin Bassett first covers the basics: choosing a Bible, materials, lettering, embellishments, and basic art techniques. More than twenty step-by-step projects explore creative ways to bring Bible pages to life using such materials and techniques as stamping, stenciling, pens and colored pencils, washi tape, acrylics, collage, and watercolor. 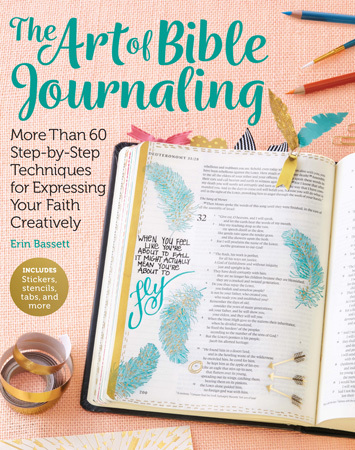 Those who go beyond basic Bible journaling to explore Godâ€™s word will learn how to faith journal outside the Bible, journal on the go, and customize their journaling Bibles. Bonus items include black-and-white art to trace or copy and paste, colorful stickers to embellish Bible pages, and versatile templates to make it easy to get started with Bible journaling!